February 17th, 2001 Your Country Music Source! a new draw every week! Some people are even getting two CD's! Just click here and find out how you can win! You've probably noticed the change in That's Country by now. I'm still trying to move pages around as time allows but, to the most part, it's done! The nice part of the new program is the fact that people can now post on the website(s). If you have anything you'd like to share with our That's Country readers, please do post it. This is available to both fans and artists and..... IT'S AS EASY AS SENDING AN EMAIL!!!!! The directions, username and password are in the articles on the right side of the main page entitles "Add Your Article". For obvious reasons, I have to approve the article before it shows up on the website but I'm usually checking in often. If the article is time-sensitive, please do send me an email and let me know it needs to be published. I've also added a "classified" section for anyone who wants to advertise anything and it's totally FREE! This is NOT meant as a dating service and I will not be approving these posts. I received a great new book in the mail last week and I just have to share this with you! 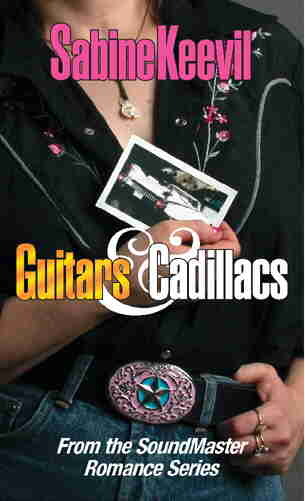 The book is called Guitars & Cadillacs (from the SoundMaster Romance Series), written by Sabine Keevil. I read the first couple of pages, fully intending to put the book down and review it when I had more time. The book was so good, I couldn't put it down! Needless to say, I read the whole book that day ( I'm a fast reader) and I'm looking forward to the next book in the series, which will be released in the spring. Guitars and Cadillacs is about a Country superstar and a radio announcer who meet on the worst of terms and chronicles how building a relationship with a public icon isn't the easiest thing to do, especially when the parties concerned have skeletons in their closet. Since it was launched on January 1st, 2002, That's Canadian Country's visitors have steadily increased. Unfortunately, it wasn't the case with the "Rise to the Stars" competition. I was letting everyone know who was competing to begin with but so many people complained about the increase in email or just dropped off my list that I stopped sending the notifications. Unless the artists competing let their fans know about the voting, the competition dropped off the face of the earth! I ended up discontinuing it last week. I do intend to bring it back on That's Country, but not until April. If you want your song on the competition, please send your press kit to the address below. Please let me know which song you're like to compete with. The first ballots have already been sent out to members and the second set are almost ready to go out. We're pleased to announce the Good Brothers will be hosting the show again this year and Beverley Mahood and Casey Clarke will be co-hosting. The Country Radio Seminar is coming up on Feb. 27th - Mar. 3rd, 2002 and That's Country will be in Nashville to bring you the highlights. The CRS is always a great place to see established artists as well as acquainting yourself with the talents of many "New Faces"